This year marked the 20th running of this event, and so even while the GNCC crew can try to re-rout some trail, cut some fresh stuff, and even run significant sections in different directions (as was the case this year compared to 2018) the same basic feel remains. For one thing, that feel is rough—the track seems like it’s just whooped out the entire way, either with sand whoops down by the creek, or square-edged stuff up and down the hills. This is like motocross for three hours. On a more specific note, Rockstar Energy Husqvarna’s Thad Duvall had the place scouted perfectly. He had a special line picked out on the last lap, and he used it to get around Kailub Russell to steal the victory here for the second-straight year. Duvall used to be known as Bad Thad as in bad fast—he was super quick but prone to crashes, bad luck, and mistakes. He’s come a long way as a racer and used his experience to figure out strategy in advance. There was a time, once he really got things rolling, that Kailub Russell would get super, super angry anytime he lost a race, even including the time he tried racing a 150 two-stroke against 350s and 450s, got fourth, shrugged off everyone’s congratulations and then won on the 150 the next weekend. He. Does. Not. Like. Losing. However, he’s cooled it just slightly these days, in pursuit of his sixth-straight GNCC Championship. At round one, in Florida, Steward Baylor put it to him and Russell could do nothing but tip his visor and give him props. Russell won round two in Georgia, then led most of the way here at Steele Creek before a mud hole did him in. At that point, the old Russell would have probably stomped off, but he took it slightly more in stride now. “It was a good track, I was happy with the way I rode, it just didn’t work out,” he said. Look, the last five years have shown that over the average, it’s hard to beat Russell consistently over a 13-round season. He’s not going to win every race but as long as he avoids disaster, he’s always going to be in a good position. Finishes of 2-1-2 in the first three races are fine for the title, and for once KR doesn’t seem to be completely disgusted if he doesn’t win every single time. Duvall’s always a major threat, though. Anyone else? The FMF KTM team’s main rival is Rockstar Husqvarna, which had put Russell and Duvall into battle head-to-head for years. Husky grabbed up-and-comer Trevor Bollinger (who had ridden for Honda) this year, also, so the question was if he could become a weekly threat against the dynamic duo up front. So far, he’s proven he can be, by challenging Russell all day at round two in Georgia, and then leading some of his home race here in North Carolina. This was a three-rider duel most of the way, until lappers got Bollinger. Russell and Duvall battles have been fun to watch the last few years, just as Russell versus Josh Strang or Charlie Mullins, or Josh Strang versus Paul Whibley were before that. How deep can today’s elite pack get? Bollinger is showing signs. Others have potential. Russell’s new teammate in the XC1 Class is former XC2 (250F) champ Josh Toth. He has talent like Bollinger, but it has taken Trevor three seasons to get to the point where he can key off of Russell and Duvall. Can Toth make that leap? Monster Energy/Babbitt’s Kawasaki has looked good in Team Green’s return to GNCC, but the veteran Strang and Jordan Ashburn, are just a tick off the leaders so far. The Kawi team operates as if it never left, though, as they have a lot of experienced hands that can get this program to the front quickly. 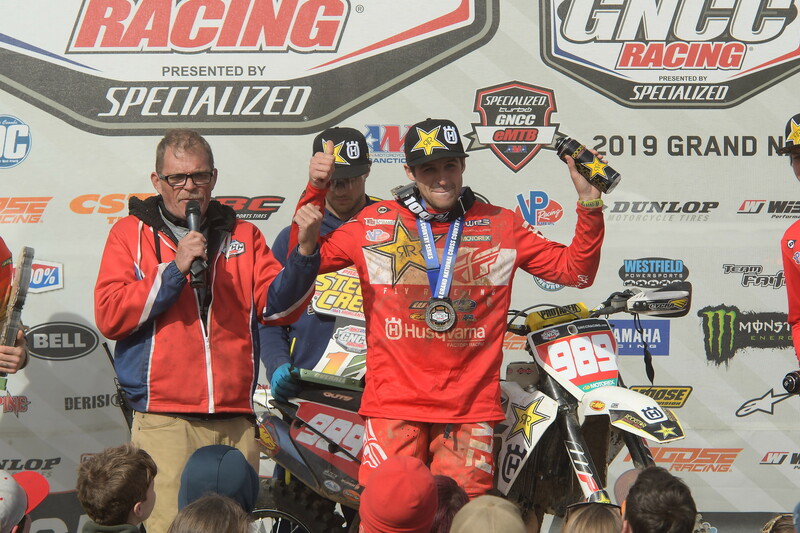 Of course, in GNCC, you always have to factor in Steward Baylor, who is really kind of a wild card like James Stewart was in his last few strong supercross seasons. On some days, he’s just crazy fast. You just never know when those days will come. Despite dealing with injuries coming into the season Stu waxed everyone at the rough, sandy opener in Florida. He was fourth at round two and fourth again here, while feeling a bit under the weather. His bum knee is probably a problem, too. Still, the next race is in Stu’s home state of South Carolina. You never know—he could just take off and win another.